I remember the first time I boarded a plane and left Canada. I was off to the Dominican Republic on a typically North American holiday: the all-inclusive resort package. I was 21 years old and ready for some sun and relaxation. Just getting that little taste of the Caribbean made me want to experience more overseas adventures. Two years later I went to Mexico with Nick to show him the world I was interested in and always talked about. We packed up our suitcases and went on yet another all-inclusive, all-you-can-eat-and-drink vacation. Us setting out on a trip through the jungle by ATV. Look out, here we come! Tulum, Mexico. Like us, every traveller has something that inspired them to leave their lives behind and follow their dreams of travel. Whether you were born with the travel bug, your parents handed it down to you or you just picked it up along the way, there's that lightbulb moment when you realize: I want more from my life! Getting a taste of the Dominican Republic was my lightbulb, Mexico was Nick's. The travel bug was in him! From the moment we touched down at home in Calgary he was constantly asking me “If you could travel around the world for a year, where would you go?” I had always been interested in SE Asia. Not only is it easy on the wallet, but I found the culture, the food, the tropics and the stunning beaches to be very appealing. Nick couldn't agree more and as of then, SE Asia was at the forefront of our thoughts. Oh ya, SE Asia was definitely at the forefront of our thoughts! 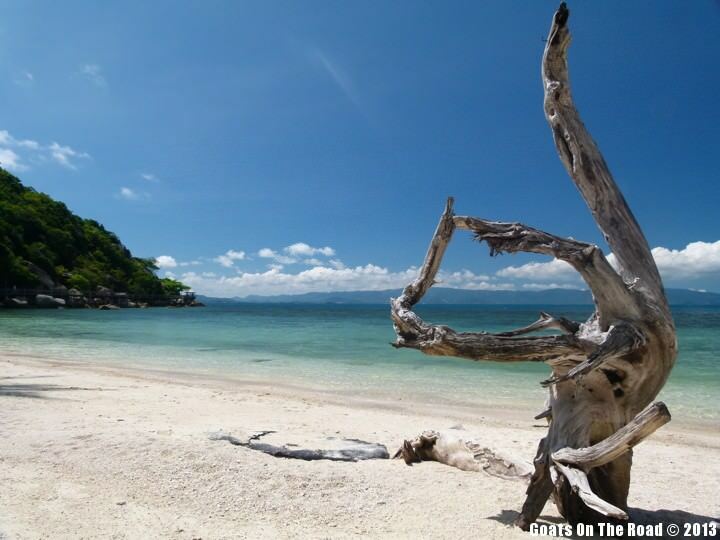 Beautiful Leela Beach, Koh Phangan, Thailand. Our interests had become consumed by travel. We started reading motivational blogs like The Planet D, Travel Independent, Vagabondish and Nomadic Matt. We'd go to our local bookstore to read Lonely Planet Guidebooks and do some daydreaming about where we'd like to go. This definitely got our travel juices flowing. Suddenly our house, car, jobs and material things didn't seem so appealing…we wanted to go abroad. 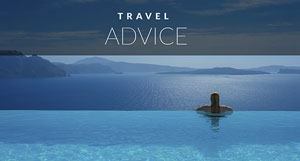 We read many Lonely Planet Guidebooks to get our travel juices flowing. We fell in love with a T.V. show called Departures. 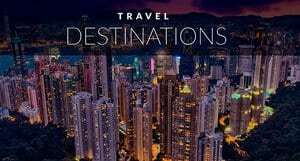 The 3 Canadian guys who travel around the world on this program (Scott Wilson, Justin Lukach and Andre Dupuis) dropped everything in their lives to “just travel”. 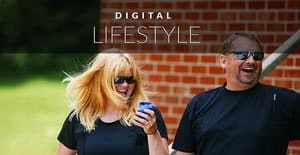 They felt the same way we were starting to feel – like there was something more to life than working from 9-5 and waiting for the freedom of retirement. We figured if they could drop everything, so could we! This show helped reiterate the fact that we were on the right track and gave us the final push we needed. We decided to just go for it and started planning an epic, year long trip to Southeast Asia. The tv show that motivated us to leave the boring behind: Departures. Once we landed in our first destination, Thailand, we knew the year was going to be a special one. That year was the most amazing, eye opening experience we've ever had. The travel bug had grown! After that year-long trip in Asia, we went back to Canada for one year only to realize that the western way of life wasn't for us anymore. We saved as much money as we could, packed up and left again. We've been backpacking for 3 years now and have been wearing our “Departures” t-shirts with pride…and since laundry days are few and far between, the shirts get worn more often than they should! Representing Departures in Morocco, Mozambique, Myanmar, Greece, Nepal and Egypt. We've visited the Middle East, Africa, the Sub-Continent, SE Asia, Asia and parts of Europe and we don't see our journey ending anytime soon. Travelling the world was once just a dream, but now it has become our lifestyle. 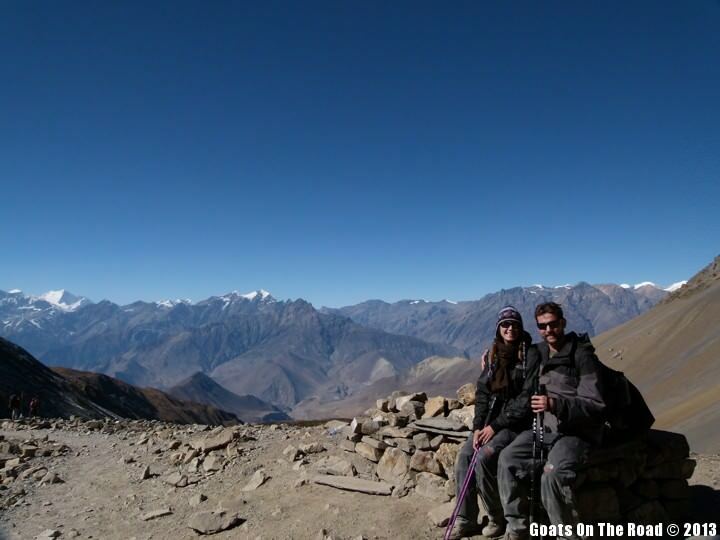 Us living out our travel dreams on the Annapurna Circuit in Nepal. Cheers to pursuing our passion! 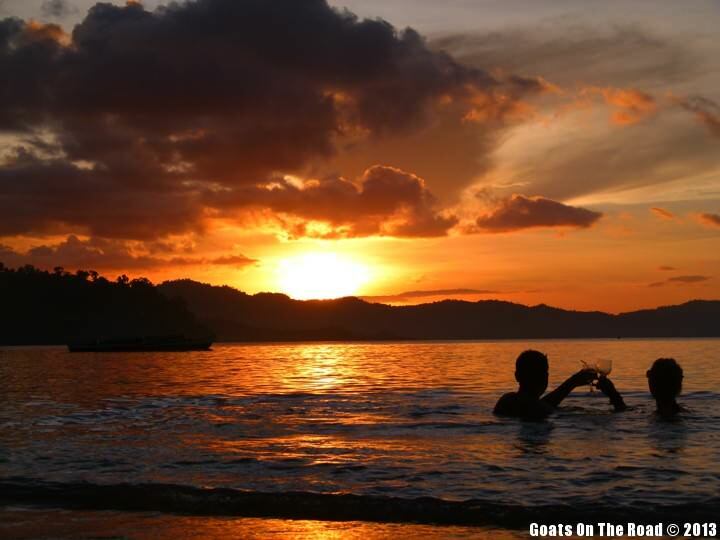 Enjoying a sunset at Port Barton Beach, Philippines. 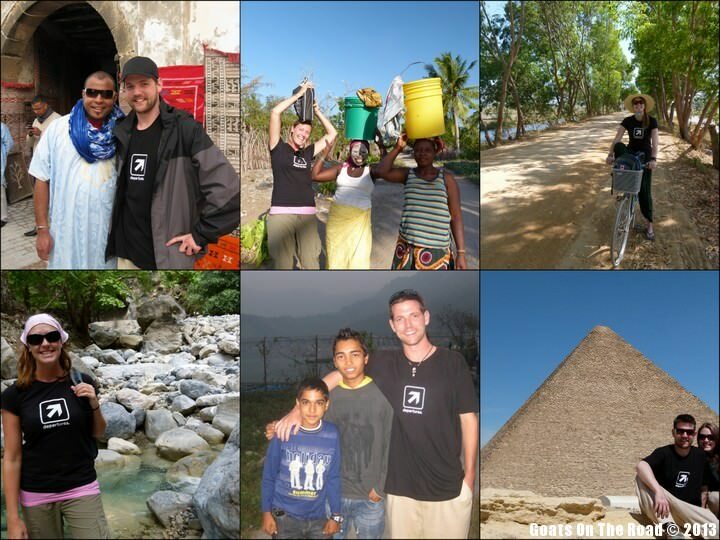 Over three years ago we were inspired to drop everything and travel. What continues to inspire us to stay on the road are the warm people we meet, the exotic sights and smells, the stunning landscapes and the sense of independence and freedom that travel has given us. We hope to be an inspiration for others to pursue their ideal lifestyle. With a bit of cash in the bank and an open mind, anyone can leave the mundane behind and seek out new adventures! Check out our Preparing To Travel Around The World How-To Guide: Preparing To Travel Around The World for ideas on how to get started. What was your inspiration to pack up and leave the ordinary behind? Tell us about it below! Nick & Dariece have left everything behind in search of cultural experiences, beautiful beaches and off the beaten path adventures. 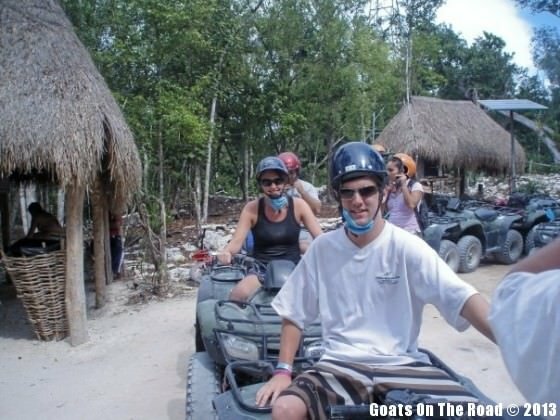 They call themselves Goats On The Road and their Website For Budget Backpackers website for budget backpackers encourages others to pack their bags and leave the ordinary behind. 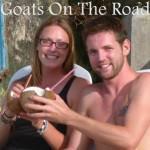 Visit Goats on the Road to get excellent tips for the adventurous budget backpacker! Follow them on Twitter and Facebook too! 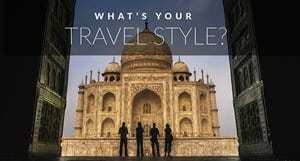 11 Responses to "Inspiration for Traveling Around the World"
This is the third time I am reading your post. I love the way you write and the way you display your pictures. I am a big fan of photography :). It’s really nice to see you guys together all the time. I heard a lot about Moscow and I wondering if could visit it next year , I like to visit saint-petersburg as well . I remember the first time I went out of the country. It felt like a whole new world that I was eager to explore. I have been doing it ever since. That first feeling of travel is overwhelming. It sticks with you the rest of your life. We hope that you can have your own amazing experience too Tom. All the best. I found my inspiration from novels! Love that you two have always stayed true to what you have wanted to do. And that you have done this all together and that this epic journey has only brought you closer together. Always love your stories.